Custom Nylon Collapsible Frisbees Personalized or Blank. Promotional, Very Inexpensive. Free pouches! Bargain Prices for USA and Canada. Free Art Design and Fast Delivery. Yellow, Green, Red, Blue, White, Purple w/ Black Trim. 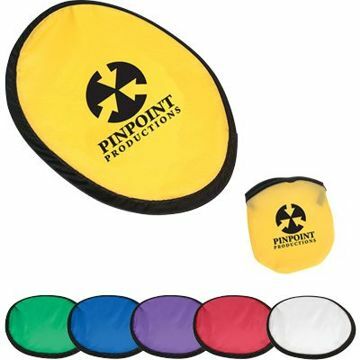 Our bulk nylon frisbees are an ideal trade show promotion, or a gift for meetings, parties, pets, indoor-outdoor events, youth, schools, church, camps, picnics, beaches and parks. Our custom imprinted foldable nylon frisbees are made of bright nylon cloth fabric with Black color rim. We also supply blank (not imprinted) nylon frisbees. Free artwork design. We will send you a proof for your approval before production. Lowest prices in the USA and Canada for personalized nylon frisbees in bulk. Free matching pouches. American clients pay no taxes.